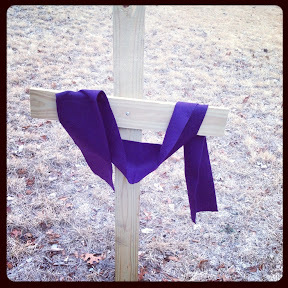 Lent Day 17: Prophet - a cross in a friend's yard. Lent Day 17: Prophet - 2.0. The Museum sharing God's message thru their lyrics. I started out wondering what I would capture, that represented today's theme: prophet. Is it the signs or things we place in our yard, or car - or even our bodies (t-shirts, tattoos, etc.). Or is it what we say? The music of The Museum (at #Veritas13) grabbed hold of me. Lyrics of songs can be prophetic. They can spread the truth - especially about things related to faith. The words of The Museum were prophetic last night, and amazingly just what I needed. 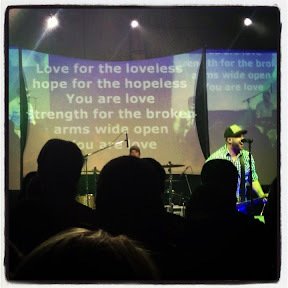 I truly felt God's love pour over me, as they sang songs full of love, hope and compassion. So a prophet doesn't need to stand on a street corner, or ascend to the top of a mountain. Sometimes they can be found on a youth conference stage.